Thomas Love Peacock (1785-1866) is one of the most distinctive prose satirists of the Romantic period. The Cambridge Edition of the Novels of Thomas Love Peacock offers the first complete text of his novels to appear for more than half a century. 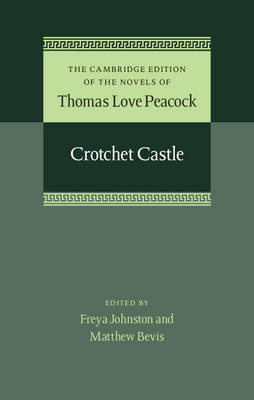 Crotchet Castle (1831), his sixth novel, contains all the humour and social satire for which Peacock is famous. Its lively farce is more ambitious than that of the earlier works in its range of cultural and intellectual targets, including progressivism, dogmatism, liberalism, sexism, mass education and the idiocies of the learned. The book constitutes an artistic, political and philosophical miscellany of sorts, thematically unified in its satirical emphasis on folly and dispute - and on the folly of dispute itself. This edition provides a full introduction, chronology, annotations and detailed textual and scholarly apparatus.